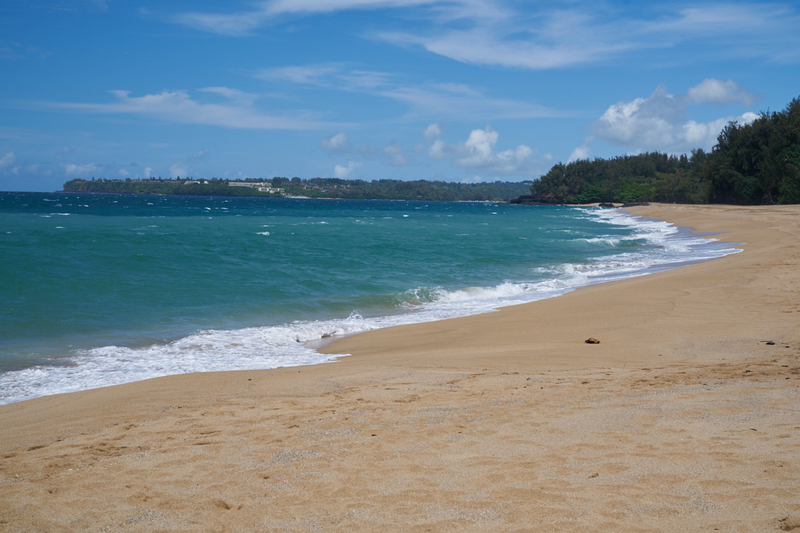 We left our friend's place in Lawai and headed east and then north along the coast. 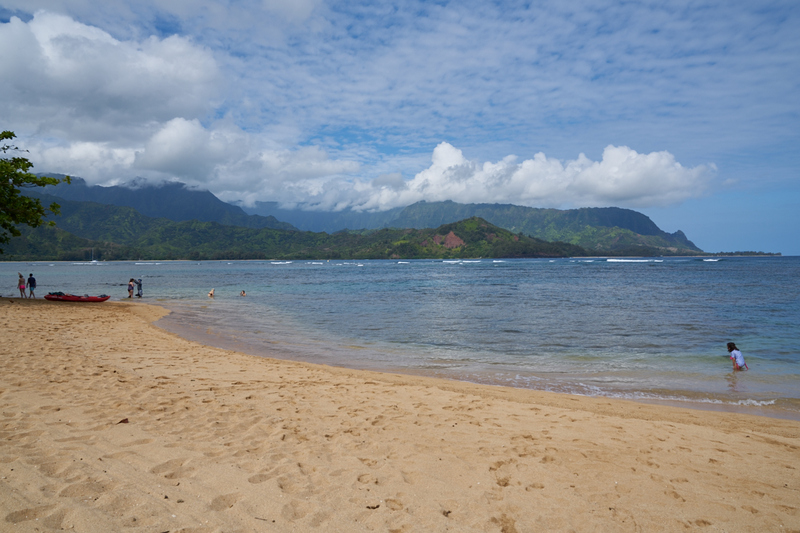 Our destination was Hanalei Bay. 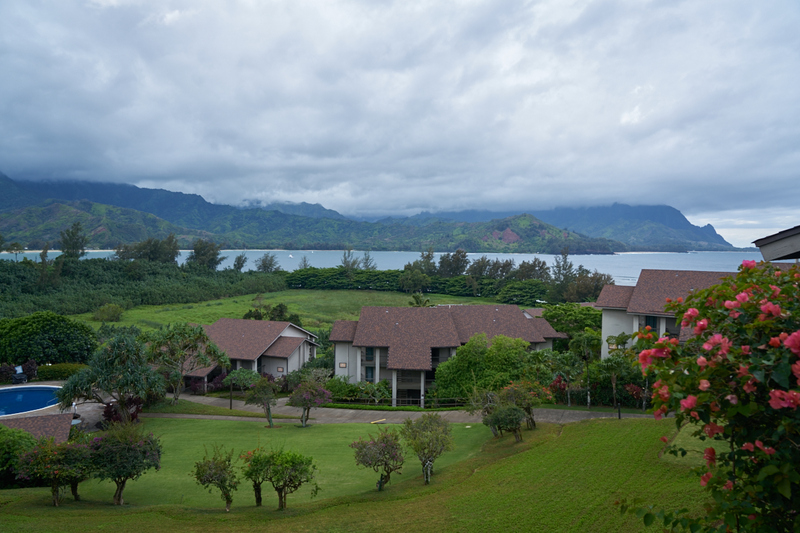 Kathleen had managed to secure several nights at the Hanalei Bay Resort, so it seemed like a good thing to do. Since we were operating without an agenda, we decided to jump on the room as it was the last one left in the area. We checked in and got our room and schlepped our stuff from the jeep to the room. When I went onto the balcony I was pleasantly surprised by the view. Below our room was the "second pool" and a BBQ shack for cooking if you were so inclined. Notice the white ship in the bay. 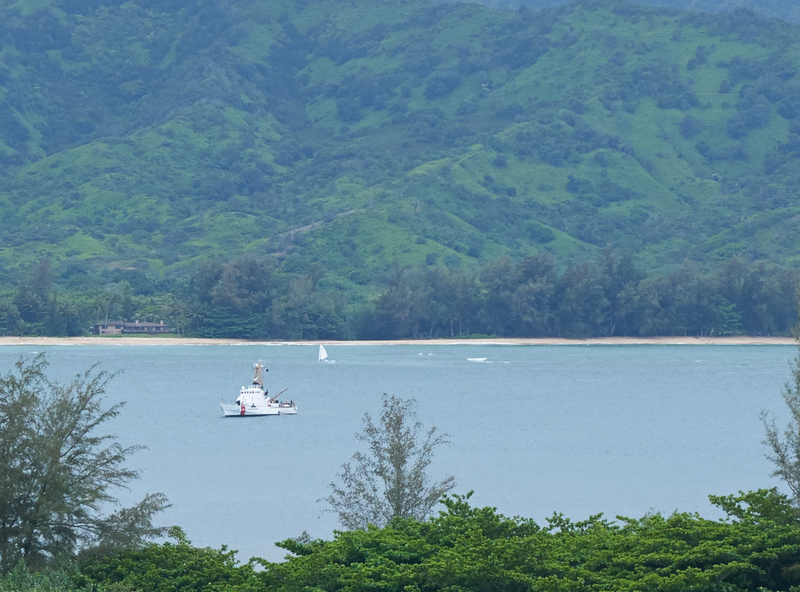 As it turned out, the white ship was not a fishing vessel but rather a Coast Guard cutter. Why it was there was a question, but careful examination of the photo above will reveal that the deck crane is deployed and seemingly hoisting something into a smaller boat moored along side of the cutter. As sundown approached we started thinking about food. 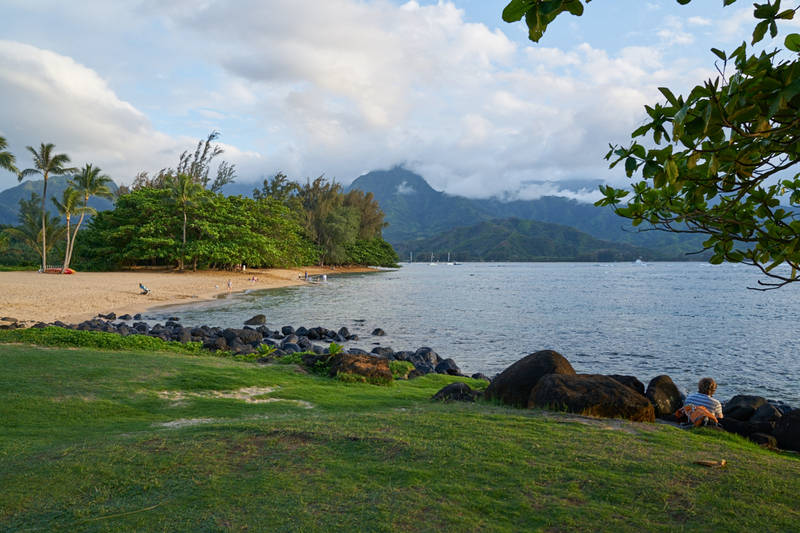 We were somewhat dismayed to find out that the restaurant at the Hanalei Bay was closed for refurbishment. 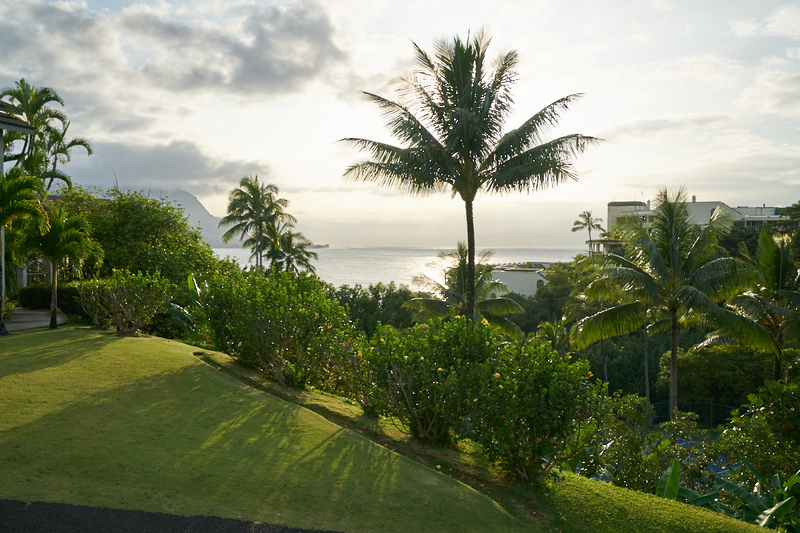 I say "somewhat dismayed" because the alternative was walking down the cliff trail to the St. Regis Resort which has a 5-star restaurant. Which, in my mind, was not a bad thing. It was about an hour from sundown so we decided to head down the hill anyway. The paved trail was down a narrow side canyon and was quite steep. And, when your room is at the top of the hill, what goes down must come up at the end of the night. When we got to the bottom of the canyon we could see across a field to the rugged mountains to the south. 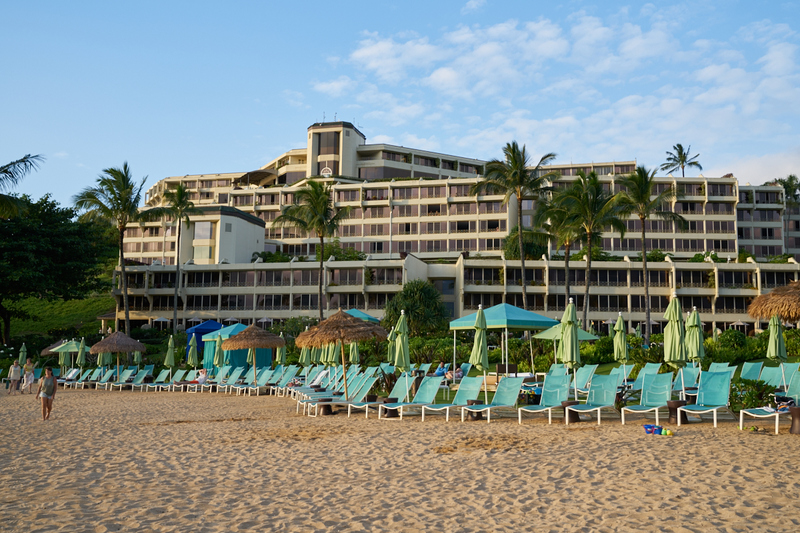 The St. Regis is quite a place and likely the nicest resort on the north shore of Kauai. And at $700/night for a basic room you would HOPE it would be nice. We did not stay there, but we did eat several meals there. Not surprisingly, they were a tad pricey too. The hotel is built into the cliff and has on the order of 10 floors (at least according the the elevators we were in). 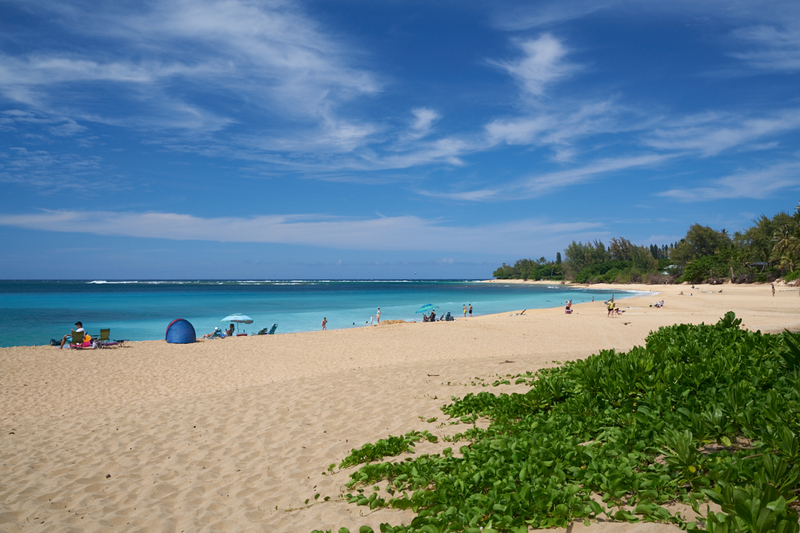 The beach area is nice, clean and well-staffed. The clouds were hanging over the mountain tops to the south making for an otherworldly view. Kathleen and I decided to eat in the better restaurant at the hotel. It was embarrassingly expensive but I must say that the food exceeded my expectations. After all the food and wine we had to hike back up the hill to our room. Sunrise the next morning was much clearer than the night before allowing a nice view of the mountains beyond Hanalei Bay. We decided to eat something and headed to the on-site restaurant to be told that they were closed until 11am and that "the closest place is the St. Regis". Hmmm. 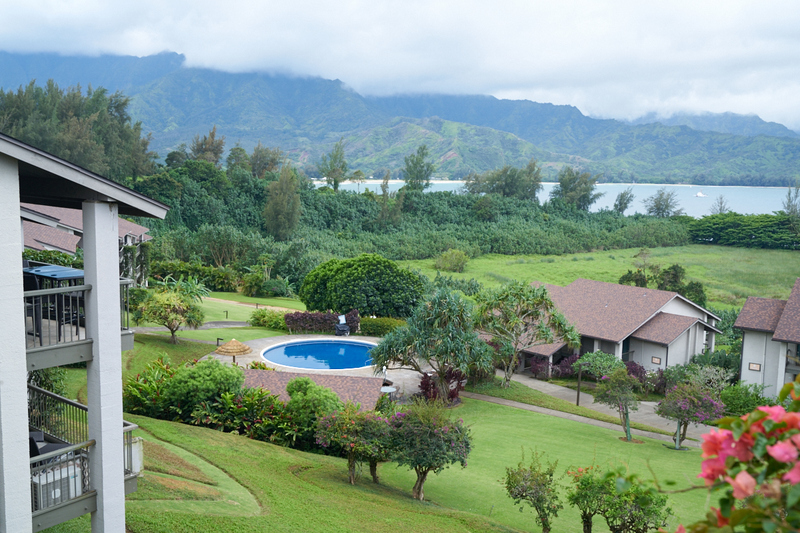 We hiked down the hill and got a nice view of Hanalei Bay. In the early days of our country, we had "separation of church and state". 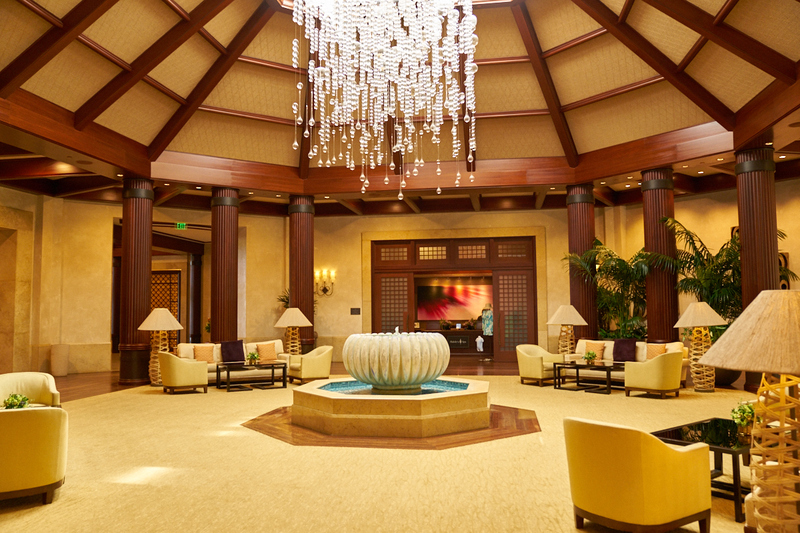 Here at the St. Regis, we have "separation of tourists and money". They have raised it to a fine art. 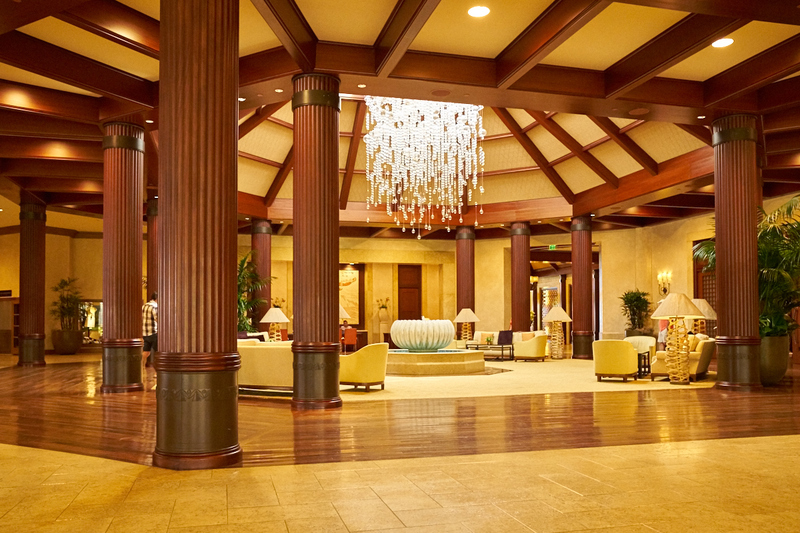 The atrium in the lobby is a case in point. The center of the atrium had an interesting pumpkin-shaped fountain. 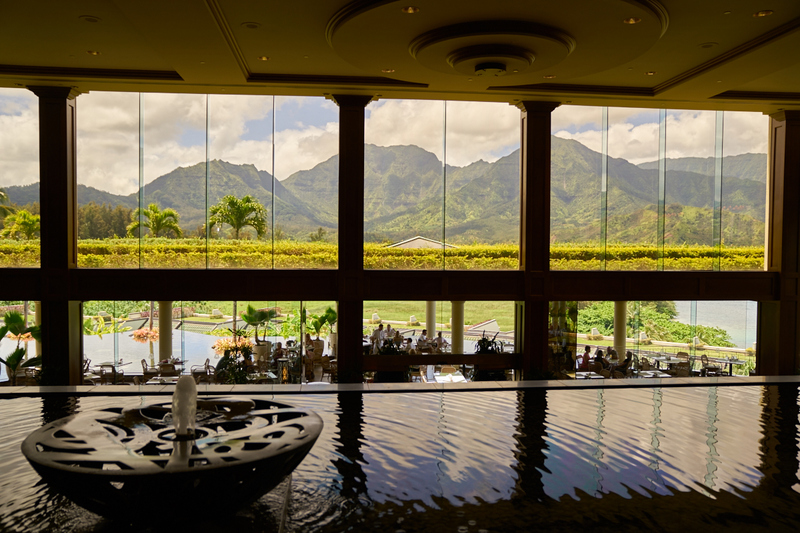 Above the breakfast area was a nice pool and a panoramic window with outstanding views of the mountains to the south. We had the breakfast buffet at the St. Regis and it was just OK. When asked for comments about my experience, I gave a scathing review which resulted in them compping the meal. That was not my intention, but given the circumstances it seemed appropriate. 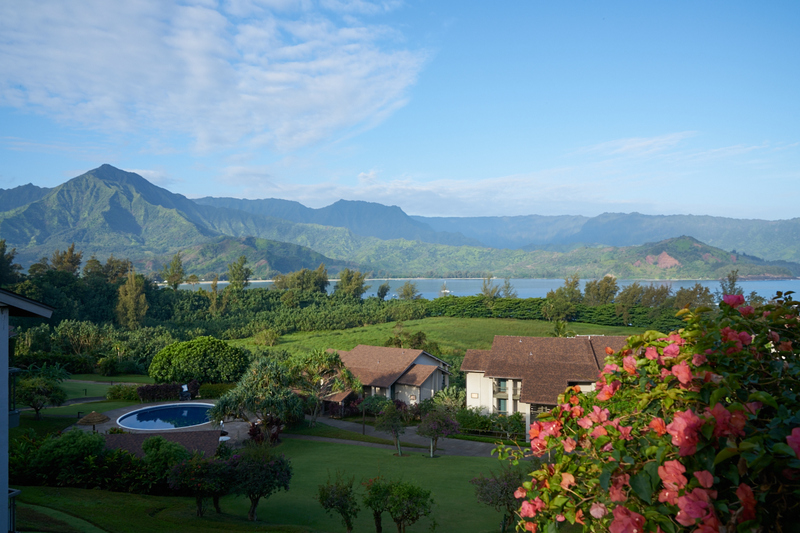 As we were leaving we got a nice view of the surf in Hanalei Bay. 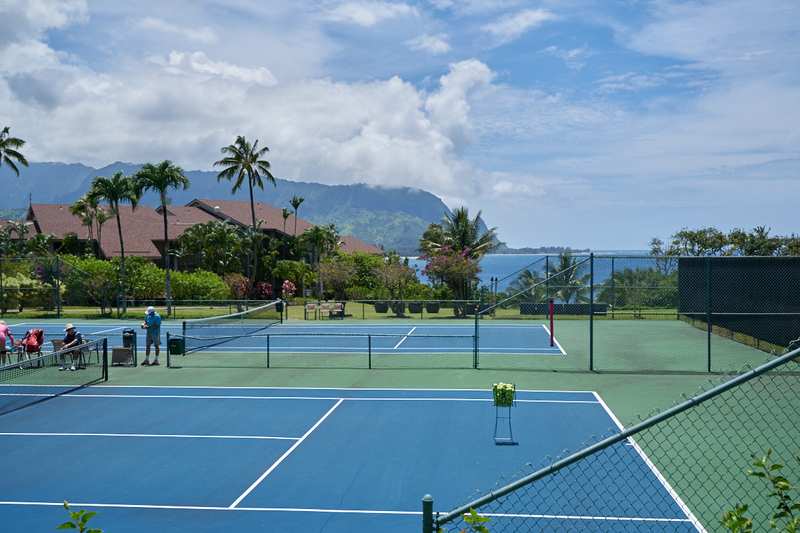 A hot, sweaty hike up the hill gave us a look at the Hanalei Bay's tennis courts with a nice view of the bay beyond. 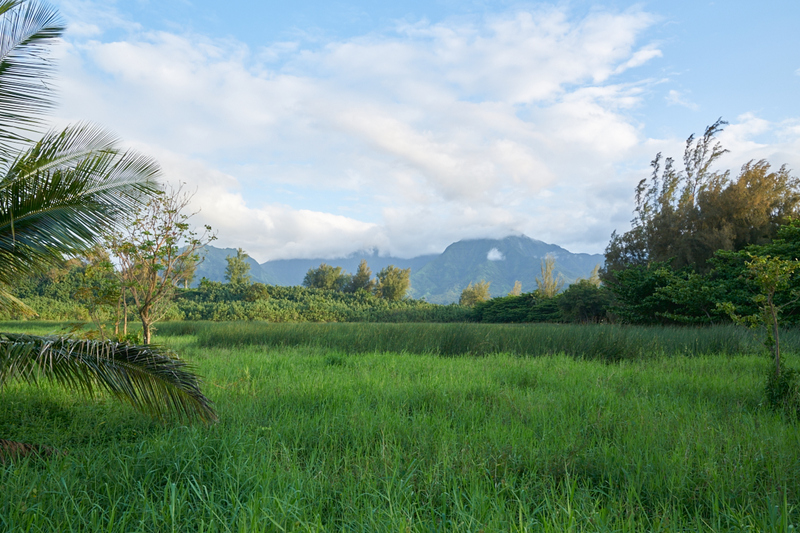 We decided to drive to the south end of Hanalei Bay. I saw the cliffs to the south and stopped to take a photo. Note the white vertical line in the center of the cliffs. 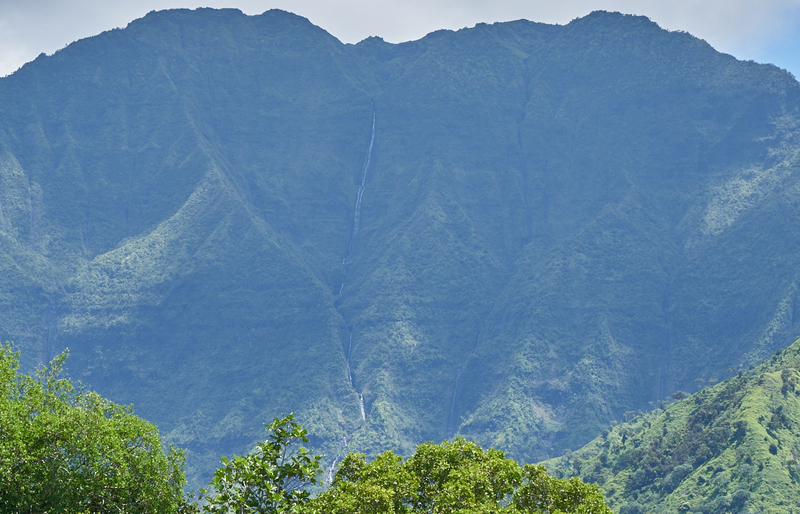 A zoom of the previous photo reveals that the white line is in fact a huge waterfall that cascades thousands of feet from the upper peaks to the valley floor below. This set of falls is best seen from a helicopter tour (in the works) as getting there on foot would be quite a challenge. 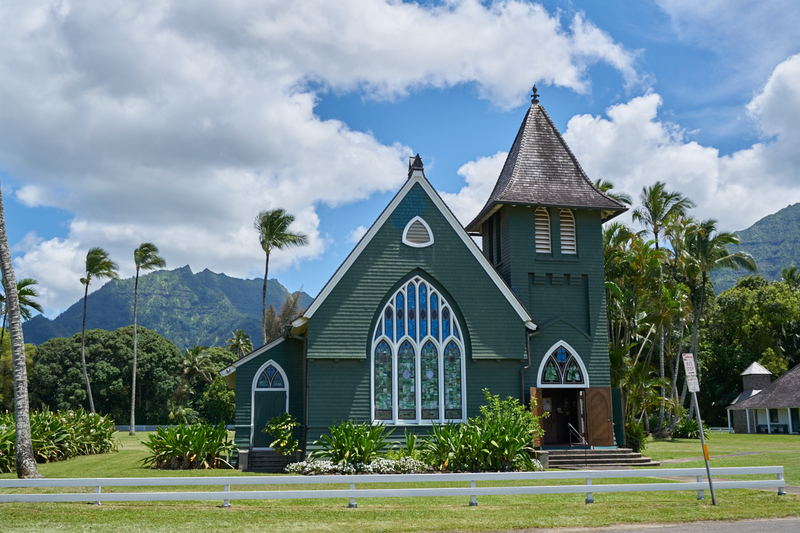 We passed this interesting church next to the road, so we decided to check it out. 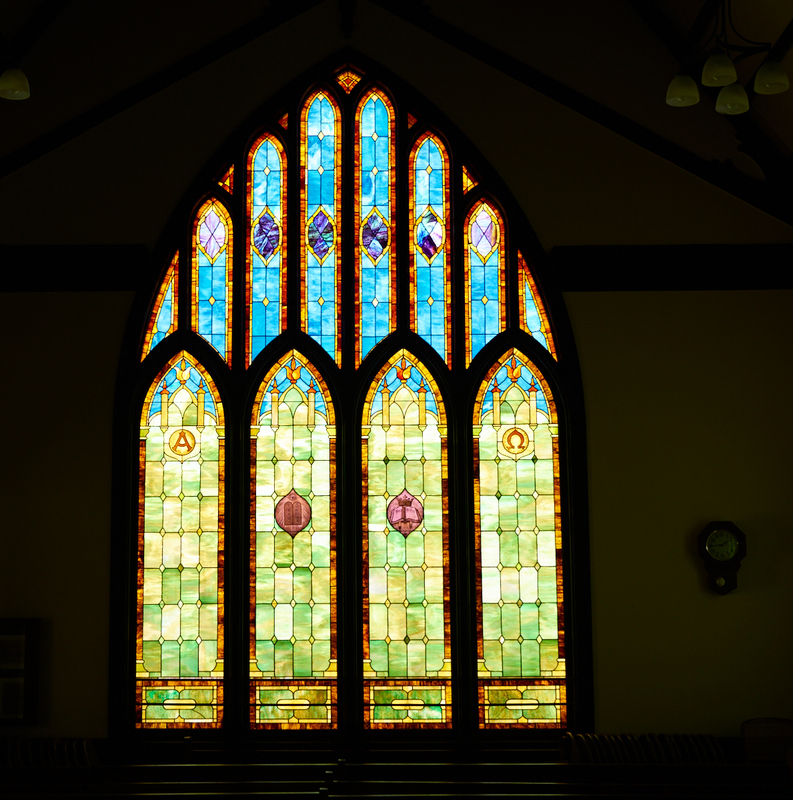 Despite the small size of the church building, it had a very nice stained glass window on the north-facing side. 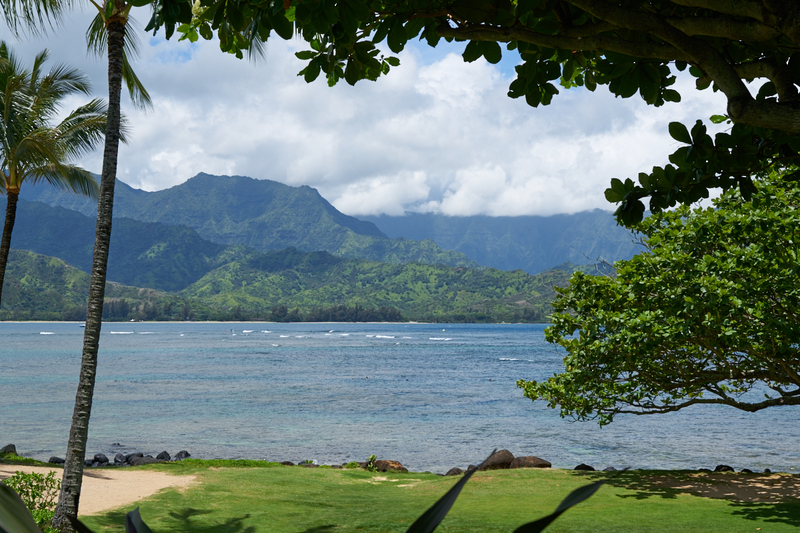 Continuing to the west along the north shore we came to a turn-out that gave us a nice view of Hanalei Bay. The trade winds were blowing hard throwing spray from the waves in our faces. 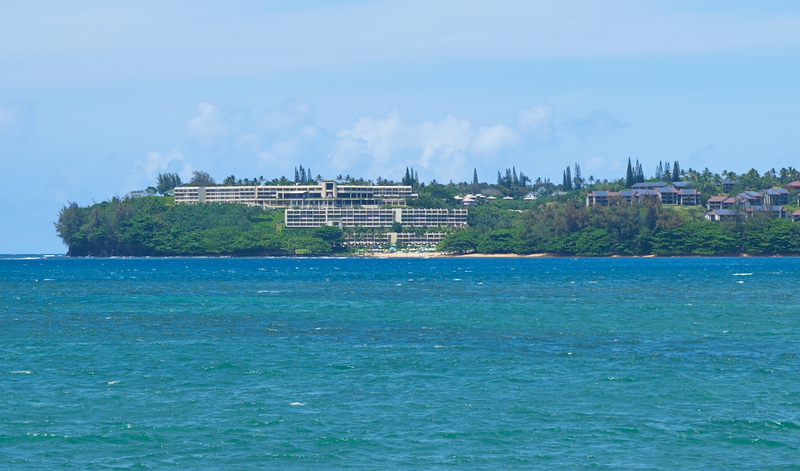 Across the bay we could see the St. Regis and Hanalei Bay Resorts. The trade winds were whipping up some small white caps on the bay. 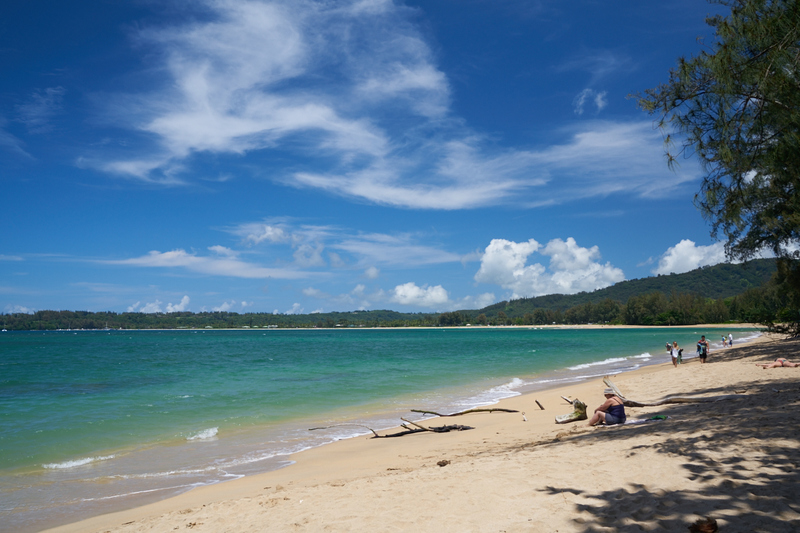 A bit further down the road we found another beach that had nice shade trees. We followed the road west over many one-lane bridges to a state park. There was a fellow there selling "shave ice" which are sno-cones, Hawaiian style. 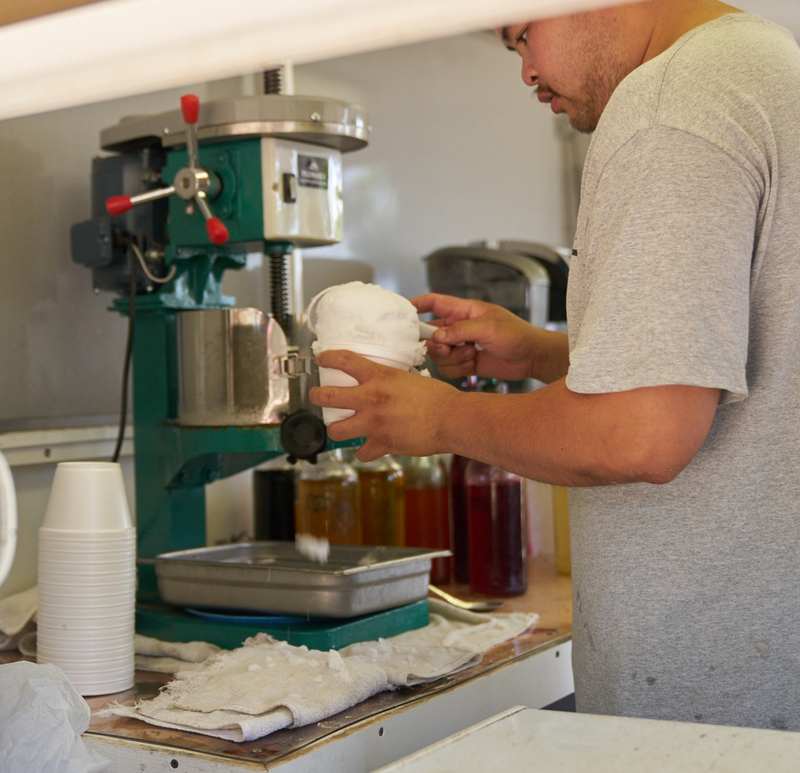 The shave ice machine looks like a drill press with a spiked chuck for spinning the ice blocks. The shaver is in the bottom and the shavings are scooped into a cup and then topped with a flavored sauce. It was quite tasty and very refreshing given that the outside temperature was 90 degrees and it was quite humid. Across the road from the shave ice concession was a sea cave like something out of Pirates of the Caribbean. 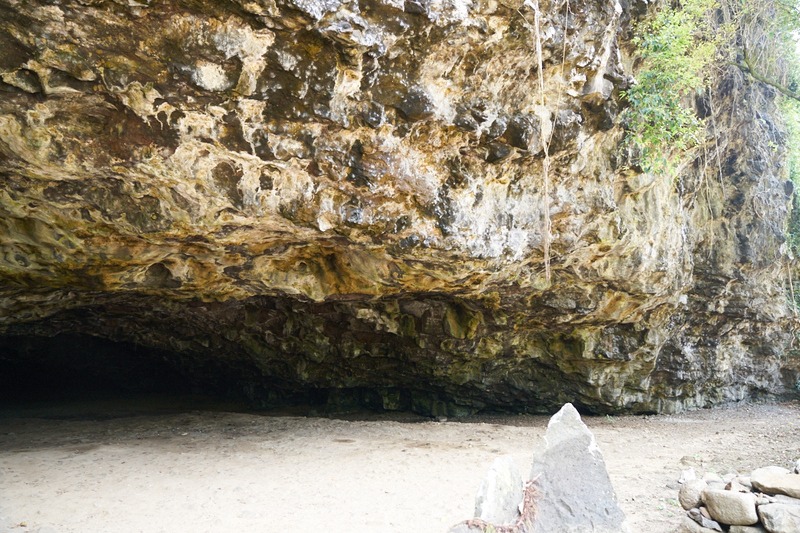 It was perhaps 50 meters deep and 8 meters tall. It would be an interesting shelter except during high tide and a storm in which case it would be filled with sea water. 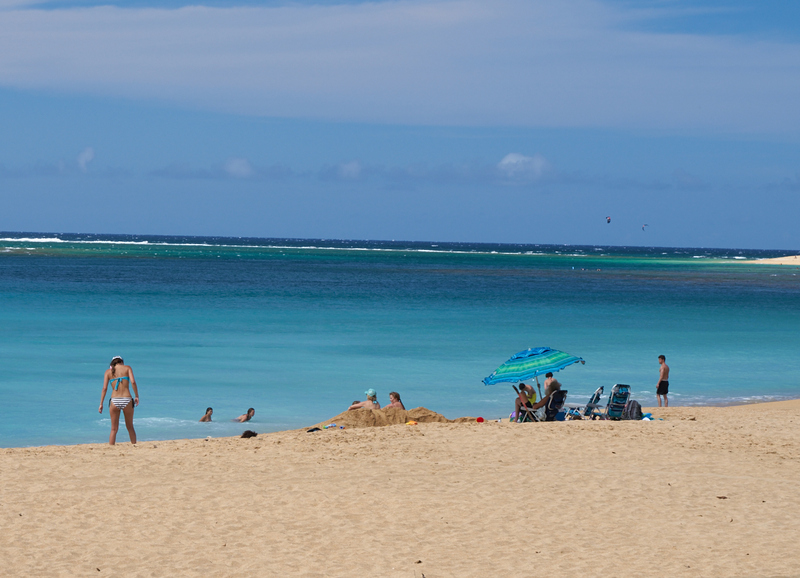 We walked out onto the beach at the state park and were rewarded with a great view of the turquoise water. By now, the clouds had burned off and it was scalding hot. In the distance I could see some movement on the horizon. 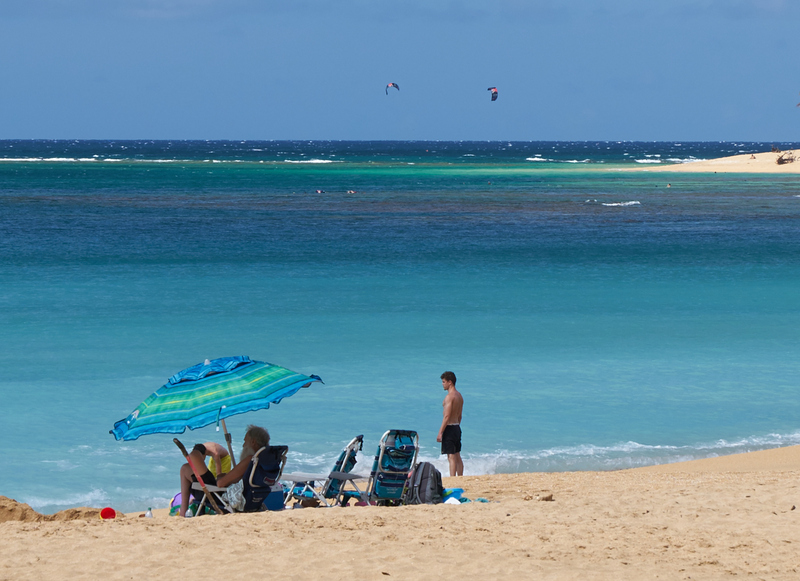 The movement was a pair of kite surfers working the trade winds. Sometimes, experiences are defined by what you see. 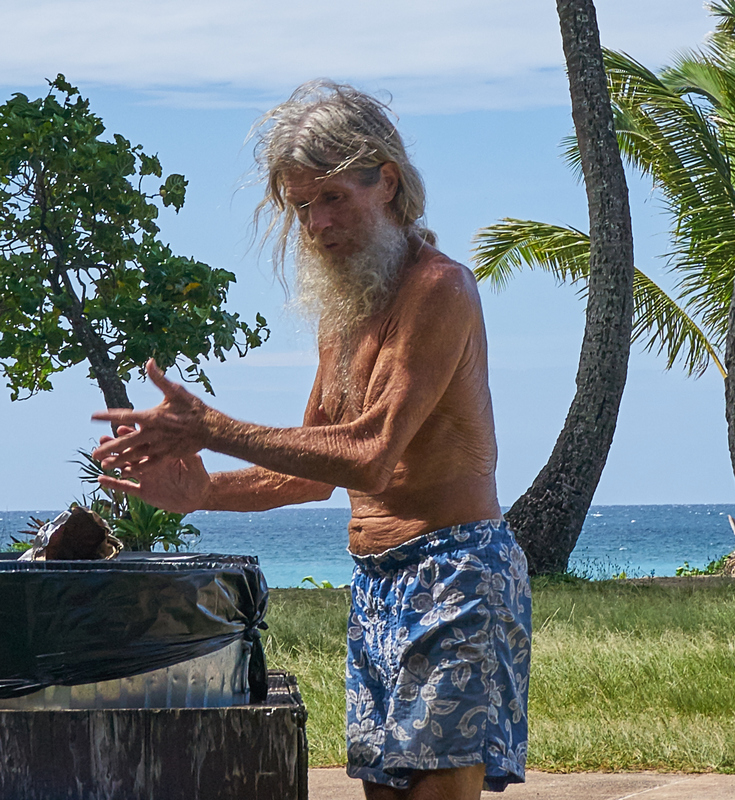 This fellow came from the beach to surf the trash can looking for treasures. He looks like he has had a hard life. We followed the road to the absolute end which was another state park. We found a place to park and Kathleen informed me that we were "going on a short hike". It was short, only 1.0 miles round trip, but very steep and very rough. 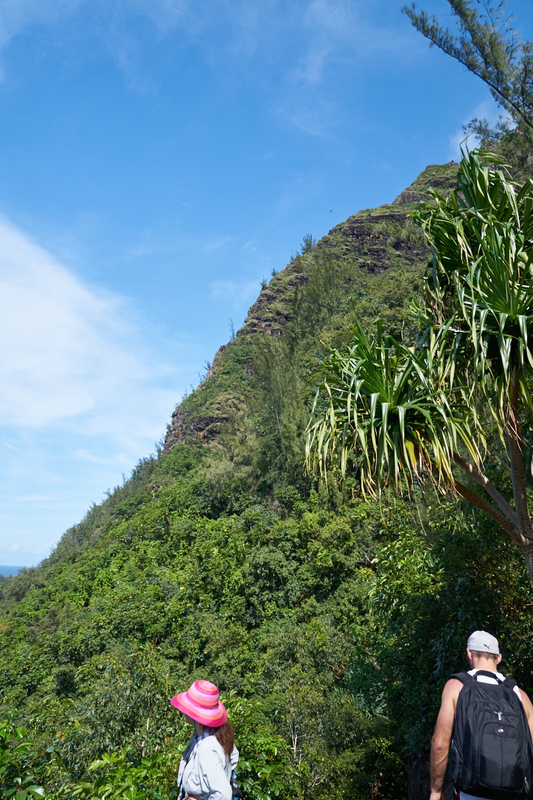 The full Napali trail is 11 miles one-way along the rugged coast, but we were only going to do the first (and steepest) part. At the 0.25 mile mark, we were rewarded with great view of the beach below. 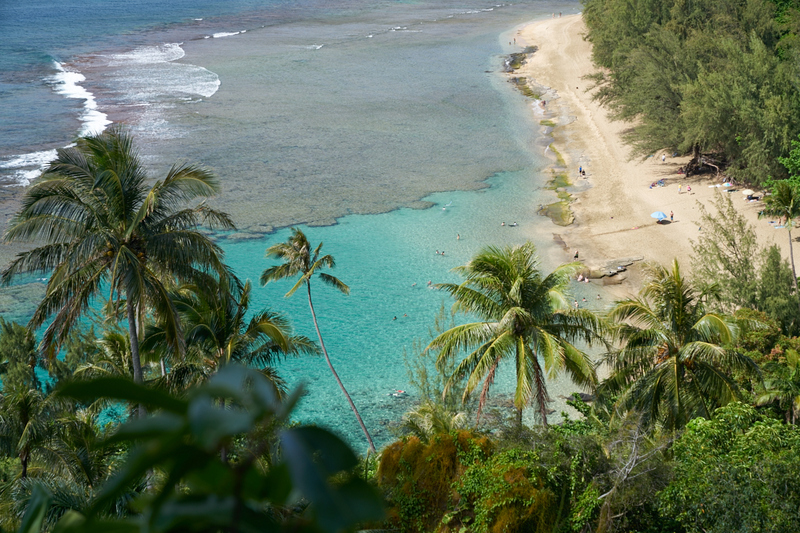 The lagoon at the bottom of the photo above is sheltered from the surf by a coral reef. Note the color of the water. The terrain near the first overlook at the 0.25 mile mark was really steep. 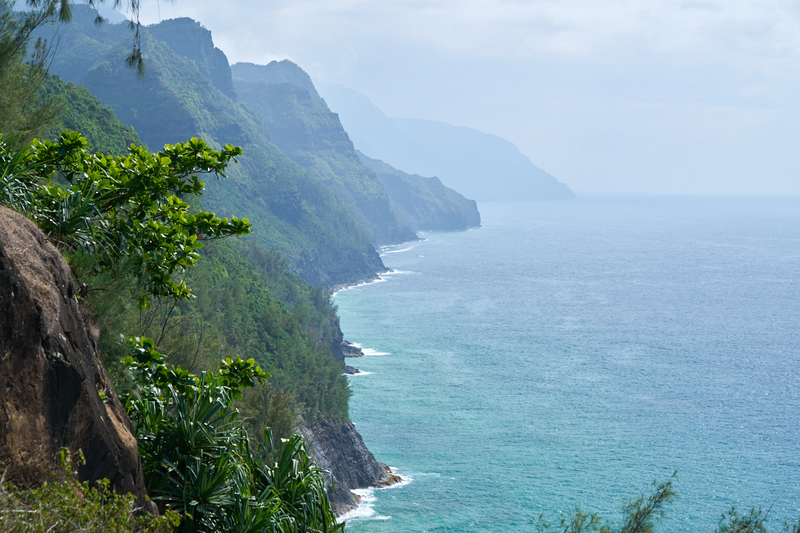 We reached the 0.5 mile overlook and got our first view of the Napali coastline. 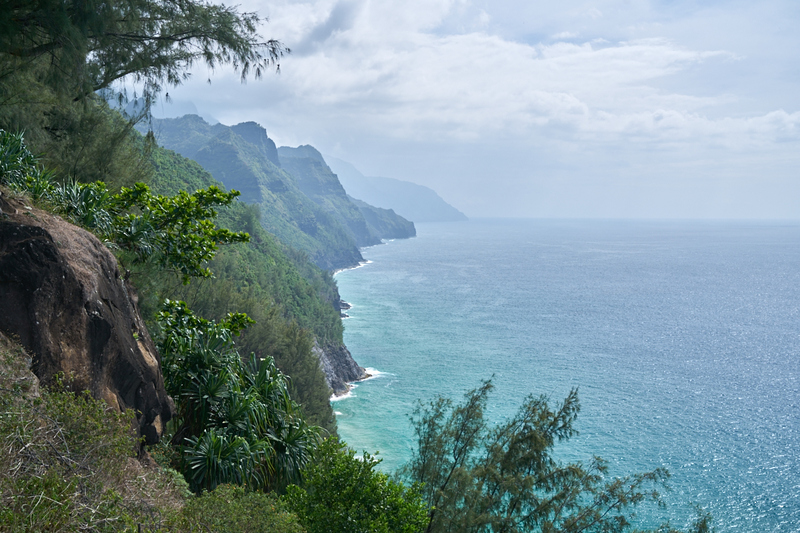 The cliffs come right down to the water and are so steep that they reflect the waves back into the ocean. Notice the curving arcs in the lower right of the photo? These are the reflected waves -- just like electromagnetic waves hitting a conducting surface! 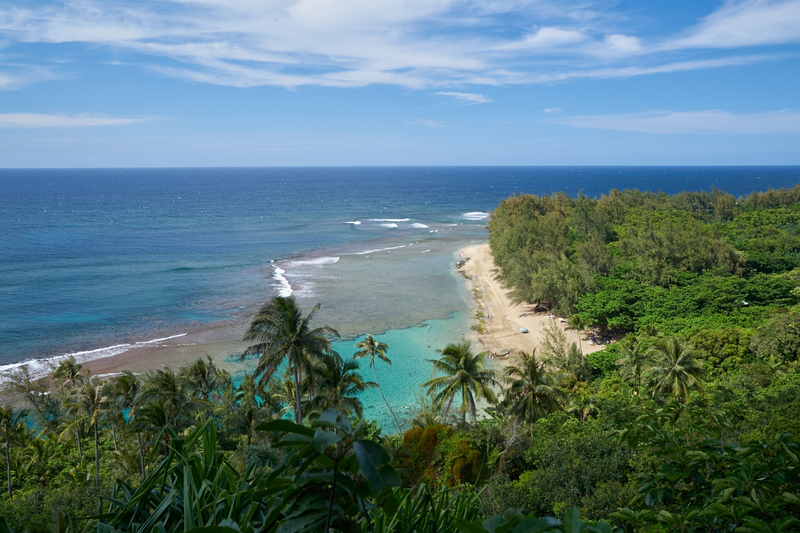 I am sure that this view is something to behold in the presence of large surf. These cliffs are nearly vertical and go for many tens of miles making coast landings here a near impossibility. At the 0.5 mile overlook, the peaks were right out of a science fiction movie. 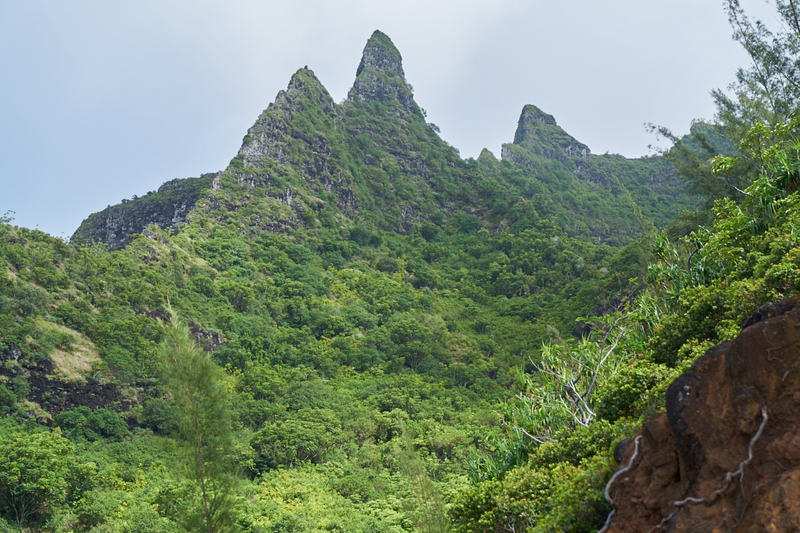 Like, say, "Jurassic Park" for instance which was filmed near here. 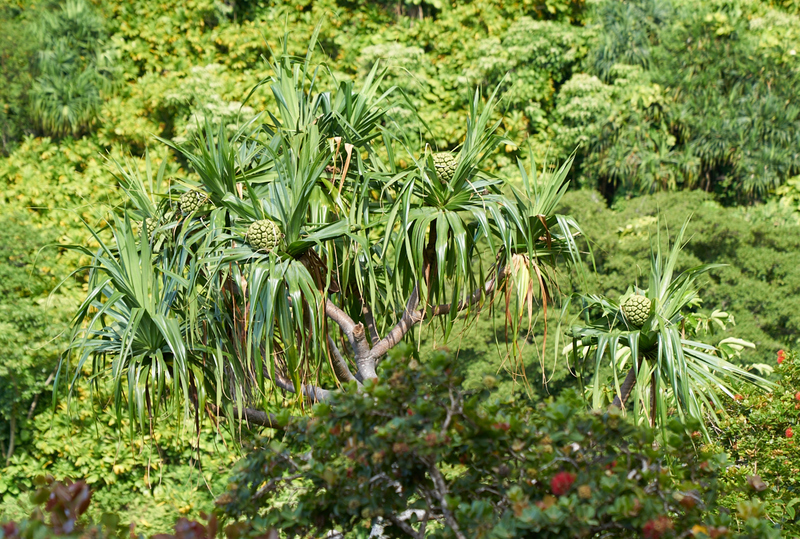 At the last overlook I spotted these interesting fruit (or seed pods) on one of the trees. I do not know what they are or if they are edible. The hike up the trail was a bit more than we bargained for. It was very steep. Much steeper than a regular staircase and it went up for a full half mile. The "trail" was a chute of basketball-sized boulders that went up the cliff making footing a chore and requiring careful attention. We passed some young buck who had a pack and was running the trail in bare feet and he stated that he left his group because they were too slow. One of the group had twisted his ankle several times and was considered "walking wounded". He did complete the 11 miles in and was working on the 11 miles out to the parking area on his injured ankle. This was a requirement, of course, as there was no other means of egress. 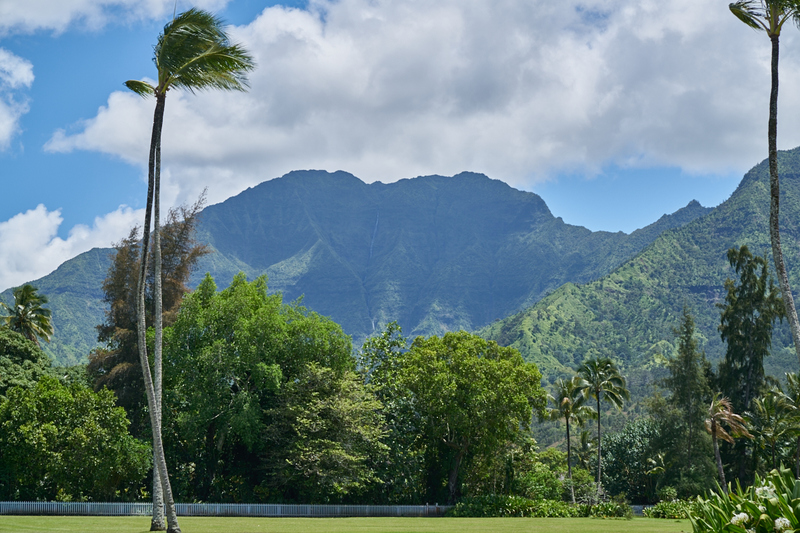 The Hanalei Bay area is very scenic and should be on your list if you are in the area.